Guaranteed to build stronger, more productive teams. Create unity while celebrating diversity, and infuse the 21st century work environment, as well as people’s lives, with an upbeat spirit of confidence and celebration. An indoor or outdoor area large enough to hold your entire group sitting in a circle. 10 sq ft per participant is a good guide. Remember, pick somewhere you can make some noise! Energizing Rhythms™ (15 to 60 minutes): A celebratory team building opening/closing activity for corporate events, retreats and conferences. Rhythms Of Community™ (45 minutes to two hours): team building, energizing and celebrating rhythms for individual departments and the entire workforce. Community Rhythm Festival™ (30 to 60 minutes): A facilitated group drumming, Drum Circle-type “jam session” to break the ice and create an upbeat spirit of community celebration. Rhythm Teams™ (60 to 180 minutes): A cooperative, not competitive, approach to integrating teams! We work with you to divide your group into teams; each team has either a different instrument type, or a mix of the same instruments (customized to serve your themes and goals). and down-to-earth way to explore Leadership Skills. Corporate Rhythm Residency™: Combine multiple programs throughout one or more days at corporate campuses, conferences, retreats, and more. 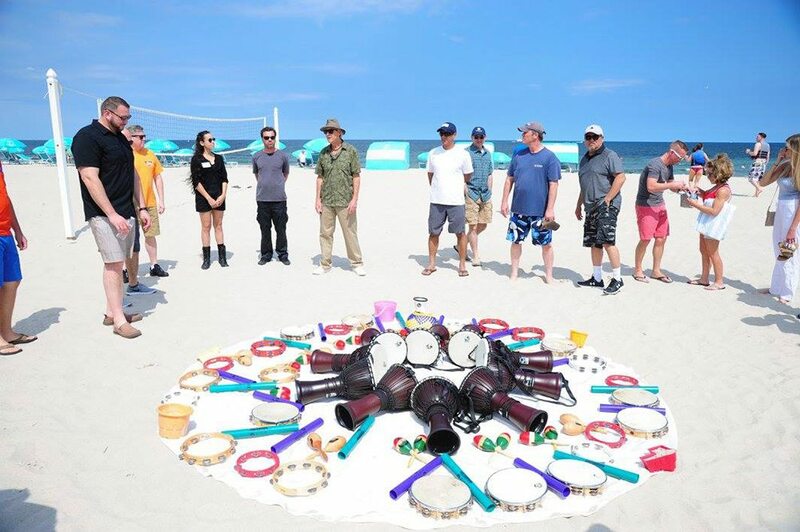 Drumming Up A Team offers a wonderful opportunity to engage and energize teamwork and harmony. Team building with drums has proven benefits in increasing employee satisfaction, loyalty and productivity while decreasing stress. Programs available using different types of instruments to fit a wide range of budgets, as well as any sound, time and space constraints. All participants often play percussion together. Small “take-away” percussion instruments, with or without your logo or theme imprinted, are also available for your group members to keep as fun, playable mementos of your event. Check out all the different variations of what we can do for your team under customization! Everyone loved it! We may be interested in doing another Drumming up a Team with almost 200 people!